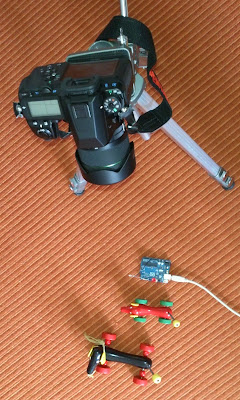 Sebastian Setz has created an Arduino library that can emulate an IR remote for a system camera. It supports all major brands. I created a sketch that takes a picture when i push a button. I used it to create a stop motion movie where it is important not to move the camera between shots. This library could also be used to make time laps shots where the camera takes pictures at a defined interval. Below you can see my set up for the stop motion. To make a video of the jpg images i used MakeAVI. 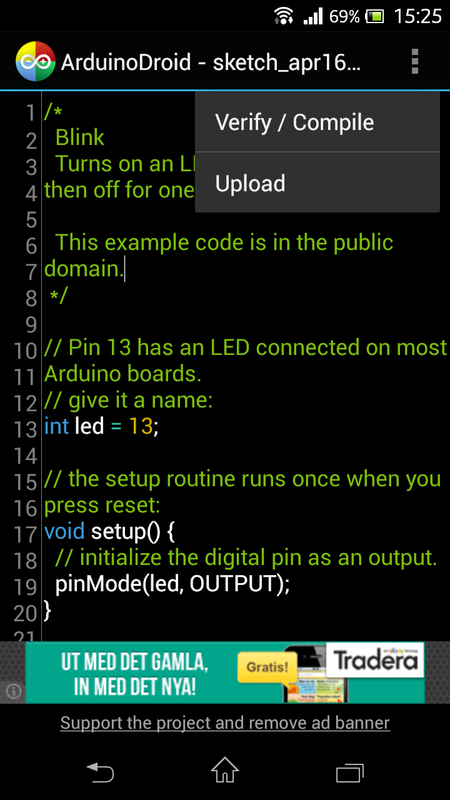 ArduinoDroid is an Arduino development environment (IDE) for Android providing (almost) the same functionality as the computer version. Almost since not all boards and functions are supported yet. 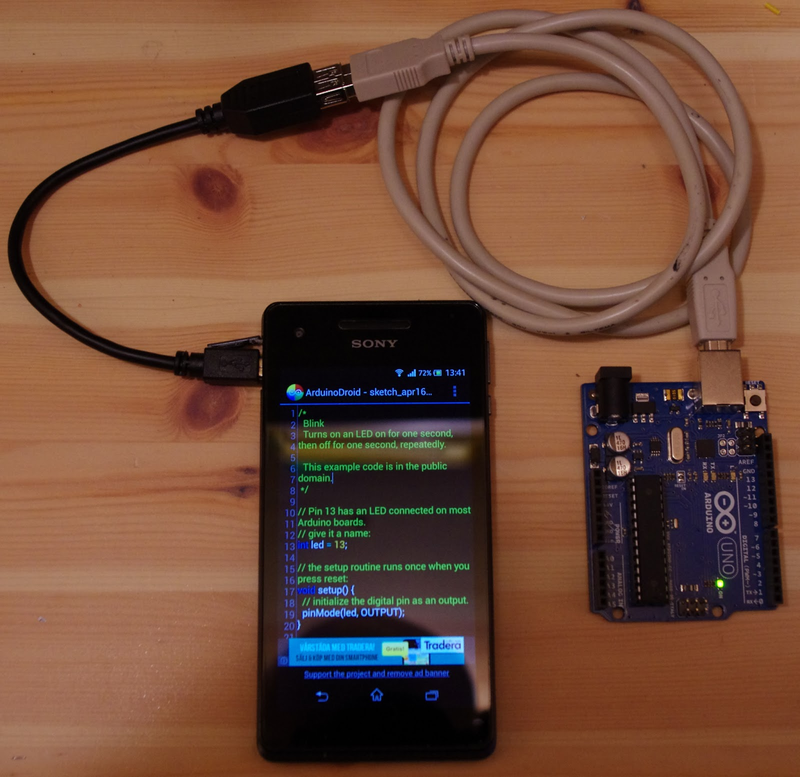 An OTG cable and Android device capable of OTG are needed to upload code to the board. 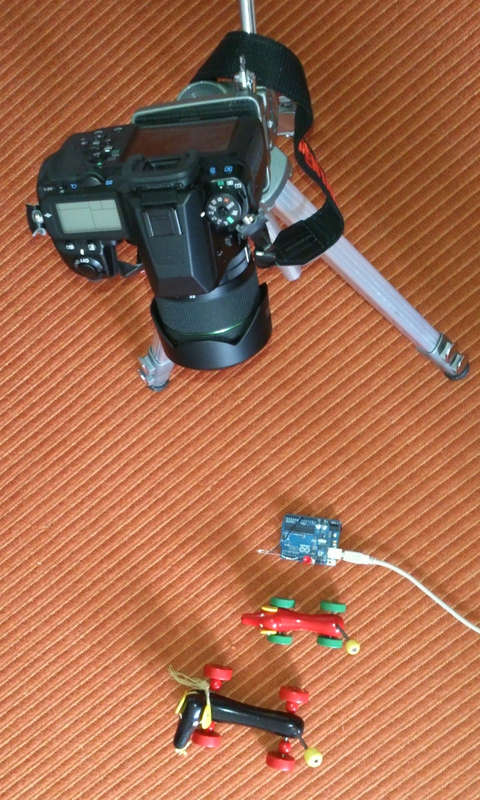 I loaded the app on my Sony Xperia V and compiled the blinker example.Then I connected the Arduino UNO and upload it without problems! A great job done by Anton Smirnov that develops this. In this post I use an Arduino Pro Mini 5V 16 MHz MEGA328 powered by an external 5 V source. My application will run on a small battery so I need to minimize the power consumption. I measured the board to consume about 16 mA in normal operation. Disabled the power on LED by removing the current limiting resistor. It got down to 152 uA. Removed the unused on board 5 Volt regulator to avoid leakage. This resulted in 136 uA. The picture below shows the positions of the components that I have removed. Conclusion: The improvement of the modification is about 3.5 times longer standby time in sleep mode. I was hoping for a month of standby time so with the improvements it should be enough for my design. I purchased a tiny OLED display from the eBay seller wide.hk that also have a webpage. The dimensions for the module is about 13x34 mm and the interface is I2C. Hint: use the ZIP button on the github page to get all the files. For installation instructions see my previous post. Open the example ssd1306_128x32_i2c in the Arduino software. When compiling you will probably get this error mesage "ssd1306_128x32_i2c.ino:53:2: error: #error ("Height incorrect, please fix Adafruit_SSD1306.h! ");"
Save the file and compile again. This time it should complete without errors. Hint: Use CTRL+R to compile. The library is also using pin 4 as reset. This display does not have a reset terminal so just leave it unconnected. Upload the code to the Arduino and your display should wake up! Hint: Use CTRL+U to Upload.